What does it mean to be "globally literate?" The topic alone has a wide definition as it depends on perspective. According to Tony Jackson of the Asia Society, it is "the role that education must play in preparing all students for success in an interconnected world." To others, like UNESCO, global literacy is defined by the rates of literacy across the world. So, which is it? Can it be both? It seems that the term "literacy" has multiple nuances, and it is appropriate to look at it from both perspectives. Of course, we are hoping that our own students have literacy skills and that they can read, and we recognize it is important that children and adults across the world have access to education. Isn't this really the whole gist of the Common Core? We want our children to have literacy skills -- to know what they are reading and how to discern thought and intention. These skills make our students competitive in the workforce, and, dare I say, the global workforce? Therein lies the issue -- if we are really preparing our students, are they ready for the global connections they will face? Is it acceptable for them to just muddle through, learning cultural customs and practices by trial and error? Is the excuse that "being American" allows for cultural insensitivity? There is a reason why there is an American stereotype of insensitivity and this term "global literacy" should fill that gap. It is not as though we expect our students to be world travelers. They may have travel experiences (some more than we ourselves), but many may not leave their geographical location. Our school was one of the first in Connecticut to be matched with a sister school in Shandong Province, P. R. China. The students in both schools have opportunities to write to each other and share in projects, but they will probably never meet in person nor travel to each others' schools. I've been to the school in China and my colleague from that school came to the United States, but no others in our respective buildings had the "cultural experience." In fact, we had to take culture lessons before leaving the United States so that we would know and understand the customs when we arrived. Why don't we teach these customs in our own schools? Some say that we do, by providing a project night where students tell about the cultures of different places. But, these events usually become watered-down versions of food festivals and holiday celebrations. I remember being in school and our class "project" was about making Mexican food and talking about the Day of the Dead. Is that what really what we want our students to know about the world? For example, recently I myself committed a cultural faux pas while meeting with some educators for an educational project. Some of the people I knew well, and one I was meeting for the first time. When I was introduced, I immediately put out my hand to shake, and was told this individual did not shake hands on religious grounds. I hadn't even considered it because my own cultural background led me to do the "handshake" instinctively. However, it was a good point for me to consider. Being globally literate may include knowing religious customs. We will have to look at global literacy through both lenses. We all have our own teaching assignments and our own group of students to educate. We have a curriculum, a pacing guide, Common Core, teacher evaluations, and testing. How will global literacy fit in? Many argue that it can't and that we just don't have time in our already packed schedule. My goal is to share with you some resources and tools you may find useful. Many of these resources will help you get where you are already going, and have already been arranged to be user-friendly. I'm also hoping to share with you some models of educators who are succeeding in preparing students in being globally literate and discover some of their best practices. It is possible that you may be teaching in a school or district with a sister-relationship with another school somewhere in the world. When I first began pursuing a sister-school relationship with a school in Shandong Province, PRC, I had a very clear vision of how the program would benefit our students. It wasn't an "us" and "them" relationship -- it was mutually beneficial, or so I thought. The interesting thing about the start of the program was that my administrators "got it." My partner school in China "got it." However, many in the local community in my teaching town did not get it. I was called a Communist. I had upset parents calling the school. I was given a review on a teacher website that I 'spouted propaganda' to promote my 'political agenda.' Who were these people who hid behind the anonymity of the Internet? Were they parents? Community members? I highly doubt they were the students who were eager to get their pen pal letters from the school. Once those letters arrived, they didn't contain the political rhetoric some in the community expected. These middle-schoolers wanted to know what our middle-schoolers did for fun, what classes they took, what kind of music they liked (Michael Jackson was an overwhelming favorite), hobbies they enjoyed, sports they played, and pets they may (or may want to) own. They wanted to know what their school days were like, how much homework they had, and if they liked their teachers. The Chinese students wanted to know if the kids here had any brothers or sisters. They were jealous when they found out that some had multiple siblings. They wondered if our kids had yards to play in or if they lived in high-rise apartments. They wanted to share photos, gifts of pencils and friendship bracelets, and stickers. Do you know what the kids discovered? They were more alike than they thought. Quietly, the name-calling from the community ceased. Parents now want kids to be involved in the program. Schools across Connecticut line up to be partnered with schools in China. What caused the change? Is it that we are a different world than we were then? Was it too close to "9/11" and there was still a lot of patriotism? Or, was it something more subtle -- the kids talked to other kids and found out they were all just kids? Maybe it was something bigger -- parents realized their kids were going to be left behind if they didn't learn about the world around them. The press coverage when our two schools did a live chat across 12 time zones made some kids disappointed they couldn't join in. The pendulum began to swing the other way. It all comes down to perspectives. This is where having a "global" view of the world becomes the key. I do not like the term "global citizens" as it devalues our own backgrounds and experiences. One may be a world traveler, but we bring our own backgrounds and experiences with us. We may be shaped by these global connections, but a stamp in our passport does not make us a citizen of those places. However, in those travels we encounter people and cultures that may rub off on us. Are we open to seeing these from a local's perspective? Have you heard in your travels that American tourists, as a whole, are often disparaged abroad? Often, "being American" becomes an excuse for bad behavior in cultural situations. It is also perpetuated in pop culture, and now, unfortunately, even in politics. This is the perfect example of being globally incompetent. For example, when we were traveling in China, a female member of our delegation had no problem wearing a Cultural Revolution cap in places like temples and even in the Forbidden City. She thought it was funny. Wearing Mickey Mouse ears in Disney is funny -- being culturally insensitive is not. Being globally competent is something that has to be taught. Rogers and Hammerstein said that racism was inculcated at an early age Matthew Morrison "You've Got To Be Carefully Taught"-- couldn't the opposite be true? Several years ago, National Geographic was reevaluating their role in educational outreach through their teacher education programs, their programming, and their web presence. Deciding on the content for these materials led to the development of a geographic poll for recent high school graduates. I think this was given in colleges and universities, although not limited to young people in academics. Although the survey was given in 2006, try taking the survey yourself and then reflect on this question: How well would your students fare on this survey, even if the questions were modernized? Middle-schoolers did not fare better. The topic of "global literacy" is quite broad, and it feels like sometimes we are doing great things in our schools, while other times it feels like we are merely scratching the surface. Even the "experts" aren't always specific in how to achieve global goals. However, a recent experience in teaching pre-service teachers was a revelation. A graduate student, preparing to be an educator, asked “Was Gandhi a real person or just a character in a story?” This question took me by surprise. It also demonstrated to me the lack of global competence in our students. It also led me to ask myself -- Is it possible the student made it through K-12 AND college without knowing a key influencer in India? Is it indicative of our ability to "not to know" and just Google the answer? Where should that learning have taken place? Does it even matter if our students care about the world? Normally, I teach middle-schoolers whose world view is narrow, if not egocentric, and I know it is my job to expand their world view through experiences. Once they graduate, the inquisitiveness to know about the world and the people in it should and must be intrinsic. Taking informed action on global issues. This One Day in Our Lives project will tackle all four of these issues. The first three will be readily accomplished, and the last one, taking informed action, will be a longer-term goal. Depending on your classroom, you may have your students take these issues separately or collectively, even offering extra credit (or Capstone credit) for the taking informed action element. About 7 years ago, I had my students participate in iEARN's One Day in the Life project on 10/10/2010. Kids around the world on that date documented their days and then posted in forums on iEARN. We did it again the following year on 11/11/11, and then on 12/12/12. After that, it was harder to find a date that worked so it was an on-going discussion forum. Students had to log into the forum to post. Logging in was good because it allowed for privacy. The drawback -- logging in was HARD. I made six-page handouts of annotated screen shots so kids could log in and find their forums FOR EACH STUDENT. The search function did not work, so kids had to scroll through pages of postings to see if comments were made on their posts. If their response was on page 7, no one probably SAW their post to comment on it. So kids were discouraged. Students new to global collaborations had to learn to be socially responsible and be very reflective in their postings. I had a few silly students post slang expressions that needed to be deleted. Kids who posted photos or videos had a lot more feedback! For example, a group of boys in Asia made a video about noodles. It was about the different kinds of dishes you can make with noodles. It was meant to be informative, but they turned out to be unintended media stars! Takeaway? VIDEO IS IMPORTANT. One of my students said that before he went to school, he had a bowl of Cheerios and a glass of juice. A student in Indonesia said "Cool! What's Cheerios?" A teachable moment! So, as a class we discussed how one would DESCRIBE Cheerios. Whole grains pressed together into circular shapes served with cold cow's (or other) milk, but don't let it sit too long or it becomes mushy.... We were cracked up in trying to describe it! The students agreed he should take a picture of his breakfast and post it with a brief description. A few days later he had a response -- "Cool! I had fish soup for breakfast!" At first, the kids thought it was "gross" but as we are in New England, I asked "How many of you eat clam or fish chowder?" Many kids responded that it was great! "Why is it different because he had it for breakfast?" A simple topic of breakfast became a global discussion. Over the years, my involvement in the project changed. We had a connection with some international schools and connecting through iEARN was not always practical (or even available) in some countries. 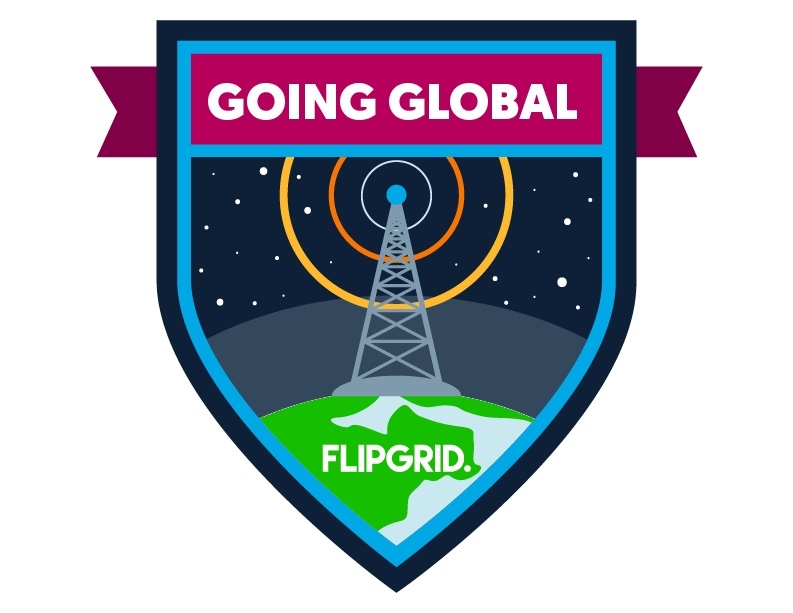 Last year, I used Google tools to make our class website interactive with the international schools, and this year we will incorporate Flipgrid into the discussions. As we learned, video always makes the experience more positive! It also gets away from having to log in to find responses. For those in the USA, connecting Global Collaboration Day to Common Core standards fits nicely into Speaking & Listening. This is one area that is often weakly supported, argued that the skill is presented in oral reports or in group activities. However, through this collaboration, students will see and hear students from multiple perspectives, on a similar prompt, AND be expected to respond to the speaker with kind comments, specific examples/details, and helpful feedback. Since it is the International Day of Peace, we will address this topic, too. Teachers, please check with your district policies on students recording themselves in these videos. Students WILL NOT need to log in to the website so we are not collecting any personal data for use outside of this classroom collaboration. They may use only their first names (or a nickname, code name) with your last name and email. Just know that student emails are often blocked in a district, so using your teacher email would be ideal. I will see all of the submissions, so please let me know if there is an issue with using a particular student. Students may also wish to flip the camera on their device to film a drawing (whiteboard animation, photographs, or other digital images) and do an audio narration only. Here is the privacy info from Flipgrid: https://legal.flipgrid.com/. More information will be posted to this page as the date draws near. Please feel free to ask questions or share additional topics you think students would wish to discuss.